During these strained economic times, many people are choosing to pull up their sod and plant their yards (or porch and patio pots) with herbs, vegetables and fruits. A good amount of sun, clean water and a little fertilizer are the standard recommendations for a healthy garden. But is there more we could do to nurture the growth of nutritious and delicious food in our own backyards? Some recent experiments have shown that the simple act of sending healthy thoughts to growing seedlings can impact and encourage hardy plant growth. In the “Manipulating Time,” featured in the January/February 2008 issue “Creating Time,” SuperConsciousness Magazine reported on the extraordinary abilities of China’s “Super Psychics” and their dedicated work in special agricultural laboratories. There, these developed psychics apply their skills “to accelerate the germination of specific seeds for the purpose of developing more robust seed stock for China’s marginal agricultural growing areas.” Deep in trance, they intentionally manipulate the seeds, advancing the time normally required to sprout seeds from days to minutes. Doing so helps the seeds to select genes that will grow faster and with greater fertility when later planted in the fields. This work is exemplary in demonstrating an advanced relationship between man/woman and the natural environment. But what about the majority of the population who have not intentionally pursued the training and development of those exceptional skills? Is it possible for most people to simply visualize their backyard gardens as healthy and productive and still make a difference in the quality of the plants? According to consciousness researcher Dr. Gary Schwartz at the University of Arizona in Tucson, early experimental data has been analyzed showing that our intentional thoughts can indeed have a measurable impact on biological processes. In the case of one of the preliminary experiments, the “targeted seeds” grew 56 mm compared to 48 mm of growth for the “control” seeds. Despite technical glitches and the necessity to further refine future experimental protocols, these initial experimental data have been exciting and are helping to establish the beginning of a pool of rigorous evidence showing that our thoughts do interface with and impact the productivity of plants. In the west, research devoted to studying these simple phenomena is rare. But resistance to exploring even the possibility of non-local, human generated and robust experimental data is at last beginning to subside, in part due to the work of lay researchers like McTaggart. The promise is that future scientific systems of thought will finally recognize, acknowledge and incorporate what many cultures have known for millennia: our intentional thoughts can have a substantive impact on the quality of our lives which can aptly be demonstrated – even in our home-grown vegetable gardens. 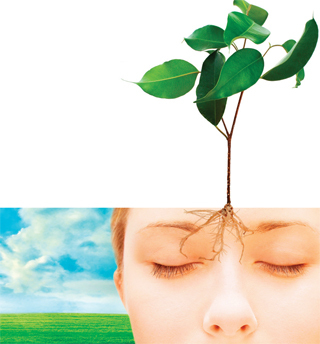 How does this research and evidence help you become more aware of your powerful mind and your relationships with the plants and environment around you? – Tell us below!